Today’s technology makes it possible for us to do so many things remotely … shop for groceries, get dinner delivered, refill a prescription, even make a visit to urgent care. Like most other services in the past, a counseling appointment with a mental health professional has always been strictly face-to-face in an office. Not anymore! Now licensed therapists are available through online video similar to Skype or Facetime. And although it seems new, it’s actually been used for decades and been proven to be as effective as traditional in-person therapy. But how can you determine if teletherapy might be right for you? 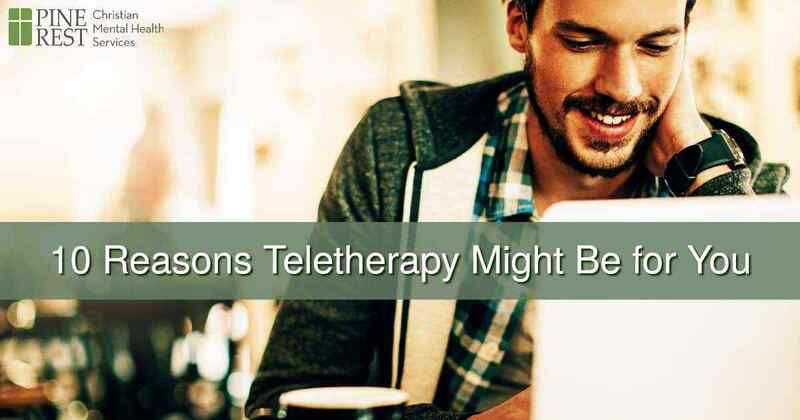 When should you choose teletherapy rather than in-person therapy? For your treatment therapy to be the most effective, a couple requisites are key. First, find a counselor you feel genuinely understands and empathizes with you. Second is to attend all of your appointments on a consistent basis for the full course of treatment. Teletherapy can help address many reasons why you might not otherwise be able to attend traditional face-to-face therapy, so that you can get the most from your treatment. Here are 10 barriers you might be facing and how teletherapy can overcome them. 1. The clinic is far, far away. Unfortunately not many therapists are located in rural areas which means driving 50, 100 or more miles for treatment. No driving with teletherapy, but you will need high-speed internet access and a smartphone, tablet or computer. 2. You don’t have convenient transportation to the office. Maybe you don’t have a vehicle, or public transportation doesn’t come anywhere close to where you live and/or the office, or it does but takes a long time each way. Family and friends may be willing to drive you, but it’s difficult to coordinate schedules. Like #1 above, no ride scheduling necessary. 3. You can’t get time off work to go to your appointment on a regular basis. If you only needed the one-hour for the appointment, the in-person appointment might work out for you. However, it’s the drive to and from that makes it difficult to schedule into your work day. With teletherapy, you can attend the visit from your office or other room where you can close the door … or even from your car. 4. Arranging for child care is difficult. You’re already asking family to help out in lots of other ways, and here’s one more. Or maybe you don’t have close family and friends who can help. Maybe you can’t afford it. 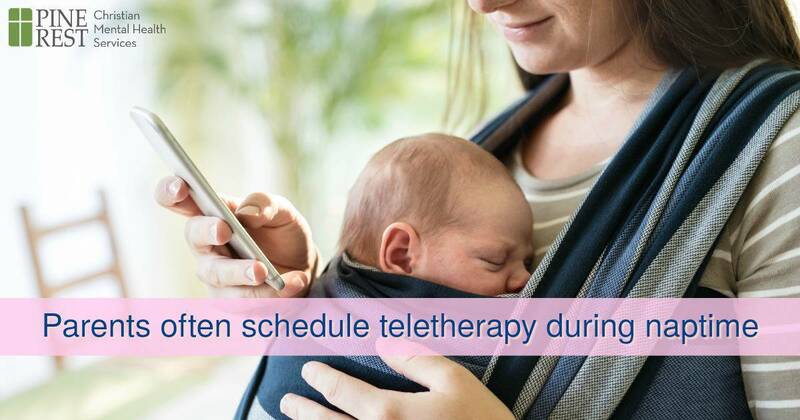 With teletherapy, parents often schedule therapy during normal nap time. 5. You have a chronic illness and just can’t manage getting to and from one more appointment. Chronic illnesses tend to leave people with low energy levels and other symptoms which make it difficult to get to a therapist’s office consistently. With teletherapy, choose a comfy outfit, make a cup of tea, and call up your therapist from the comfort of your own couch. Our patients say this really helps them get the most out of their appointment. 7. You don’t want to be seen in the parking lot or waiting room! Maybe you’re worried about your car being seen in the parking lot. We know that mental illness affects us all and that it’s a disease, but not everyone gets that. Teletherapy is completely confidential and private! 8. You’re come comfortable at home. Let’s face it. Some of us are homebodies and prefer the security and relaxation of our own space. If home is your comfort zone, then teletherapy is for you. When it’s appointment time, make a cup of tea, stay in your pajamas and get cozy on your coach. 9. You travel a lot. It’s hard to make a treatment schedule work when you don’t know where you’re going to be from week to week or month to month … or you know, but it’s not anywhere close to the clinic. With teletherapy, as long as you can connect, you can attend your session. 10. Your schedule is hectic. Like #9 above, it’s hard to make appointments consistently when your routine is anything but. With teletherapy, just make sure to block out the one-hour for your appointment time. Why choose teletherapy at Pine Rest? Our therapists are exceptional! All of our therapists are highly qualified, state-licensed and certified mental health professionals. We have nearly 100 trained clinicians so we can refer you to one who specializes in providing the care you need. Plus, we can refer you internally when needed. Our services meet or exceed all established standards. We follow all confidentiality laws and policies. Teletherapy isn’t right for everyone, but it can remove barriers for people and enable them to obtain the treatment they need to live a healthy and productive life. By Kris Brown, staff writer. Reviewed by Jean Holthaus, LISW, MSW.